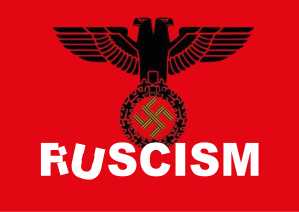 But, first let’s learn, what is “ruscism”… This term was created by combining words “Russian” and “fascism”. It was first mentioned (as “russism”) by Dzhokhar Dudayev, the first President of the Chechen Republic Ichkeria, during the First Chechen War (1994 – 1996). Then this term became popular in Georgia after the Russo-Georgian War in 2008. And now it’s widely used (as “ruscism”) by Ukrainians, some Russians and Belarusians. The term ruscism is also very close in its meaning to the term putinism, which is well-known in the world. It must be noticed, that the concept of fascism is still very obscure. What, certainly, makes it possible for the term to be misused. 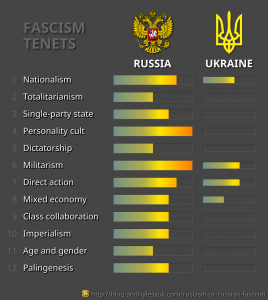 I assigned some score of each fascism tenet in modern Russia and Ukraine. You can see these scores in the picture to the right. The Wikipedia page about fascism contains the list of “core tenets” to the right (hidden by default). However, this is not a strict list of tenets, that every fascist ideology should adhere to, but rather a list of tenets, that are common for many fascist regimes. So, let’s start with checking it. Russians are convinced, that the nationalism has to be based on a particular ethnicity and, therefore, no nationalism can exist in Russia, because it’s multi-national – but, that’s not true. State or civic nationalism – the one, which is believed to be a component of fascism – can be based on a nation as people of the country. Thus, the Spanish Falange (a fascist regime) was multi-national too. In a radical form of the state nationalism people are asked to support, what is believed to be good for the state, even if it’s bad for them, and that’s what we can see in the Russian federation now. Thus, Russian people do support the Crimea annexation and Russia’s food counter-sanctions, while they have a huge negative affect on people’s life and even on the state’s economy, but are still believed to be generally good for the state somehow. Also, according to Peter Alter and David Brown the Fascist Italy and Nazi Germany were examples of the integral nationalism. This type of nationalism usually thrives in countries, that have established the state after a struggle for unification. During such struggle the nation can produce the Risorgimento (resurgence) nationalism, which can later develop into the integral one, what happened in the Fascist Italy. The Risorgimento nationalism is characterized by the desire to consolidate nation’s territories – does not this sound like what we currently see in Russia, that attempts to consolidate all former USSR states?.. To do this the Russian Federation even used military forces in Abkhazia, South Ossetia and Crimea. The successful Crimea annexation caused another rise of nationalism in Russia, what, perhaps, made it even closer to the intergral one – the same nationalism, that was in the Fascist Italy and Nazi Germany. There is no totalitarianism nor even authoritarianism in Ukraine. Russia calls the current Ukrainian government a “junta”, what could indicate a totalitarian regime, if it was true… But there is no junta in Ukraine as well. Junta is a group of militaries, and neither Oleksandr Turchynov (former acting President), nor Arseniy Yatsenyuk (prime minister), nor Petro Poroshenko (President) are militaries. Besides, the real junta does not come into government through elections. The Russian regime does not look like a really totalitarian one, but it does resemble such regime… The leading italian theorist of fascism Giovanni Gentile described totalitarianism as “total representation of the nation and total guidance of national goals”. This sounds very much like what the Putin’s regime is trying to implement in Russia. Yet it does not completely fit into the popular concept of totalitarianism… Officially, Russians call their current government a “sovereign democracy“, but many experts (including some Russian ones) describe it as a “guided democracy” instead. The guided (or managed) democracy is a democratic government with increased autocracy. In practice, this type of government is often used by authoritarian regimes to imitate democracy. That’s exactly what the Putin’s regime does, according to many experts. And authoritarianism is very close to totalitarianism, actually. Thus, Giovanni Gentile described the government of the Fascist Italy as “authoritarian democracy“. Do not take this term too literally – this tenet does not require all other parties to be outlawed. Thus, at first other parties were allowed even in the (really) fascist Italy. Instead, this concept describes the system, in which there is a dominant party (or a permanent coalition of parties) – the only one, that has the right to form the government. Such state is also called the “de facto single-party state“. And Russia is officially recognized as a state with a dominant party! Thus, the pro-presidential party United Russia currently has 238 out of 450 (53%) seats in the State Duma, the Russian President Vladimir Putin and the prime minister Dmitry Medvedev – both are associated with it, and no other parties have own members in the Cabinet. Besides, other popular Russian parties seem to be in coalition with United Russia. Thus, the leader of LDPR Vladimir Zhirinovsky proposed to make Putin an emperor – does it really look like this party is independent?.. Personality cult is exactly what can be seen in the Russian federation in regard to the President Vladimir Putin – Russian mass media created an idealized image of the Russian leader. It’s common to praise Putin, and not to criticize him. Certainly, this made Russian people believe, that their state is not going to stand without him. In general, the cult of Putin is recognized by many researchers around the world. If the totalitarianism is about total control over society and politics, the dictatorship is about who has the absolute authority in the country. Dictators are above the law, they can decide, what is legitimate and what is not. The judiciary and legislature of dictatorship countries are under the control of dictators while usually still imitate independence. This can be seen in Russia, where the State Duma is a Putin’s strong ally and courts make decisions, that are beneficial for Putin. Dictators also strive to neutralize any opposition – and this can be seen in Russia as well. Dictatorship is considered as the opposite of democracy, therefore probable dictatorship countries can be seen in democracy indices like the Economist Intelligence Unit‘s one, the Freedom in the World of the Freedom House, the Polity IV data series and the Democracies-Dictatorships (DD) index. 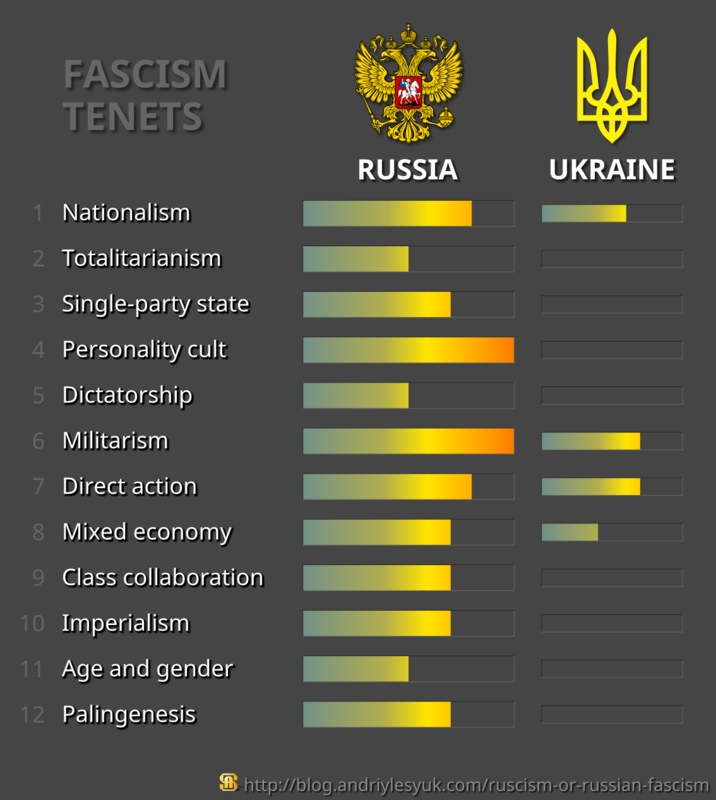 And according to all of them the Russian government does resemble the dictatorship form (the Economist Intelligence Unit gave it the status of an authoritarian regime in 2014, the Freedom House concludes that it’s “not free” in 2015, the Polity IV claimed that it was an anocracy (partially a democracy and partially a dictatorship) in 2013 and the DD index listed it as a civillian dictatorship in 2008). Militarism does exist in Ukraine – that’s true. But, it’s absolutely normal for the country, that is in the state of war! However, the militarism, as a tenet of the fascism, is about the state of peace – when the country does not participate in any armed conflict. And, if we recall Ukraine before the war, it becomes clear, that it was closer to the pacifism, than to the militarism (thus, the Ukrainian army was, in fact, ruined). Moreover, Ukraine did not enter into armed conflict, even when Russian forces had blocked Ukrainian military units in Crimea during the annexation. There is no doubt, that militarism is popular in Russia. One of the most glaring evidences of this is the love of Russians for military parades. In particular, the Russian federation is almost the only country, that celebrates the Victory in the World War II by demonstrating its military might (instead of just commemorating the dead). But, the militarism is also characterized by tendency to defend or promote national interests in a military way inside the country or abroad. The usage of armed forces by Russia in Crimea and in Georgia in 2008 without making any attempt to “defend its national interests” in a political way clearly shows, that this can be said about the Russian federation as well. Additionally, there are only two countries (as far as I know), that have threatened to use nuclear weapons against their opponents during the last decade – and Russia is one of them (the other one is North Korea). And, of course, all above is said about Russia in the state of peace. Some Russians can argue, that their country is under permanent threat of invasion by the West. However, it’s not the real threat, but just a conspiracy theory. All fascist regimes used similar theories to give a reason for improving their military power, by the way. The Euromaidan is actually a great example of the direct action – this term means, that people, usually led by an individual or a group, attempt to influence opponents directly, i.e., without any intermediary like a court or a deputy. But, if talking about the fascism, the direct action is when the fascist regime forms voluntary group(s) of people intended to struggle against its opponents. Unfortunately, it can be said, that the current Ukrainian government seems to have such groups… For example, voluntary battalions, like the “Azov“, look to be much like such groups (while they were not created by the government initially). In addition, the “trash bucket lustration” looks much like an action of such group. However, I believe, this is caused by the post-revolutionary state and the related political instability in Ukraine – i.e., not by the fascism. It should also be stated, that the direct action does not always indicate the fascism – sometimes it indicates just the people’s frustration. Besides, in the real fascism all such groups are associated with and backed by the ruling regime officially. The Putin’s regime does everything possible not to allow any direct action… by its opponents. For this it even uses the direct action by itself! The great example is the Anti-Maidan movement, that has been formed in Russia by a Putin’s close ally Alexander “The Surgeon” Zaldostanov (and others) to defend the regime from anti-government protesters. 20 thousand of Chechen “volunteers”, led by the head of the Chechen Republic Ramzan Kadyrov, who vowed to perform any special task for Putin (not for an abstract president, but literally for Putin) inside or outside the country, is another good example. But these are not all of them! There is also the Young Guard, that positions itself as a youth wing of the pro-presidential United Russia party. There was also Nashi – another youth movement, that recently split into smaller groups. But, perhaps, the most interesting example of a direct action group is the All-Russia People’s Front (ONF). This front is intended to be a coalition between the ruling United Russia party and non-governmental organizations, which meant to be independent from the government (formed of the same party’s members, by the way). Also, this coalition is led by… the President Vladimir Putin! Government intervention in economy can also happen, when a country experiences an economic crisis. So, yes, Ukraine’s economy seems to be mixed now. However, a more important question is: what does Ukraine strive for? And it strives to integrate the western economy (this is, actually, what the European integration means) and to make own economy as free as possible. Fascist regimes treat the economy as a possible target for intervention by enemies. Therefore, they strive to make economies of their states self-sufficient (also known as autarky). And this is exactly what Putin aims to do in Russia! One can conclude, that this is caused by the western sanctions – partially, it’s true, but, in fact, Putin always wanted the Russian economy to be self-sufficient (he just have not succeeded in this much yet). As I’m not an economist, I can’t judge, what is the actual intensity of the state economic intervention in Russia, but, luckily, there are indices of economic freedom, which are made by experts and which we can refer here. And according to them the Russian economy looks much like a mixed one. Thus, the Index of Economic Freedom by the Wall Street Journal claims, that the Russian economy is “mostly unfree” in 2015 (and that it was same in 2012/2013). The Economic Freedom of the World in 2011 gave Russian economy the score 6.55 out of 10 of economic freedom, what can be treated as “mostly unfree” as well. The theory of the class collaboration teaches, that people should accept their social class and do not try to struggle against other classes. Russian authorities claim, that people should not struggle against the ruling class (a similar fight of Ukrainians, i.e., Euromaidan, actually, caused the russian-ukrainian crisis). So, the class collaboration seems to be about Russia too. The Third Position does not seem to apply neither to the Russian federation nor to Ukraine. Moreover, this tenet does not seem to apply even to the Nazism, which is considered to be a form of fascism. The New Man is an idea of preparing a new better type of citizens. In the fascism this concept should be supported and propagated by the government, but this does not seem to be the case neither in Russia nor in Ukraine as well. The Crimea annexation – the first and only annexation in Europe since the World War II – clearly shows, that the imperialism does exist in Russia. Certainly, Russians claim, that this was not an occupation, but rather a return of the territory. However, initially Russia gained the Crimea during the imperial expansion (when it was the Russian Empire), so it’s still about imperialism. Besides, don’t forget about Russia-backed pseudo-states like Abkhazia, South Ossetia, Transnistria etc. The modern concept of imperialism also states, that it does not always mean the physical expansion – sometimes it’s about other forms of dominance over other states (like, e.g., economic). And, as we know, Russia strives for returning zones of influence and does not hesitate to demonstrate its dominance over some countries (e.g. by banning imported products from them). Another feature, which is common for Empires, is the rich center and poor periphery (as finances are seized for needs of the imperial center). And this can be seen in Russia, that has rich Moscow and poor provinces, as well. And, finally, there remain no doubts, that the imperialism is popular in Russia, when we recall that: Igor Strelkov (the Russian terrorist leader, who participated in the Crimea annexation and in the Donbass war) still treats his country as the Russian Empire, Vladimir Zhirinovsky (the leader of the pro-presidential LDPR party) proposed to make Putin an emperor, and so on. The Wikipedia article about fascism also contains the “Tenets” section. Some of tenets described in that section are duplicated, but others are listed only there. So, let’s discuss (some of) those unique tenets here as well. Fascism needs active followers, especially, young ones – e.g., to spread fascist ideas among young people and to be able to resist alternative ideas, that are popular among them. And there are the plenty of youth pro-presidential and pro-government organizations in Russia – e.g., already mentioned Young Guard and Nashi (-2.0). Also fascists do not recognize homosexuality, feminism etc and this is another issue, which is known to exist in Russia. Russians treat this as their “national specificity” (a similar “specificity” was in all nations, no? ), but, I believe, it’s just a social doctrine, that is propagated by the regime. According to the British political theorist Roger Griffin the polingenesis (or the polingenetic ultranationalism) is not just a tenet, but the “fascist minimum”, that differentiates fascism from para-fascism (i.e., not a true fascism). Polingenesis means “national rebirth”, that is a return to the state of a nation, when it was in some way better, to its “golden age”. And the Russian President, as well as the vast majority of Russian people, believe, that USSR was the greatest page in their history – they want the Russian federation to become as powerful as USSR, to gain the same influence in the world as USSR had and so on. In this context the Crimea annexation means a return of USSR territories – that’s why this makes Russians so happy (and the rating of the Russian President so huge). The Wikipedia page about the polingenetic ultranationalism also describes, what a fascist regime usually does to achieve this goal. Thus, it can make people believe, that the old order is decadent and alien to a common member of the nation. And Russians claim, that Western style of democracy and liberalism (that the former President Boris Yeltsin was trying to establish in Russia) is alien for them. Also, if the return to the “golden age” requires bringing back some ambiguous practices, fascists usually represent them as glorious and necessary. This reminds me current reasoning for returning some Soviet-era practices like reinstating the melody of Stalin’s anthem, the punitive psychiatry, foreign media restrictions, restrictions of foreign travels for own citizens, and more. The fascism became popular in Europe in the period between the two World Wars. The Second World War unveiled this ideology and showed, how dangerous it can be. Therefore, the Spanish Falange – the last fascist regime, that continued to exist after the WWII until 1975 – refused to recognize own fascist nature. Certainly, for the same reason any further similar regimes are going to camouflage own fascism as well. Unlike the mid-World Wars era the contemporary world has a strong vision of what is good and what is not. Therefore, to avoid being isolated a fascism regime (as well as other authoritarian regimes) is better to imitate “good” tenets. For this reason the Putin’s regime is trying to resemble the democracy, a multi-party system, presidential elections, tolerance and so on. The same reason makes Russians obscure concepts of nationalism, fascism etc. Naturally, Putin is also trying to conceal his true aims. Thus, the occupation of the Crimea, that looks to be needed generally as a military base, was represented as care for people of the peninsula, the supply of weapons and militants to the Donbass, what ensures that the conflict lasts longer, is represented as an attempt to protect the locals, and so on. However, in Russia the hypocrisy is not just a tool for achieving goals, it’s now more a kind of the state ideology – it is present in both, external and internal affairs. For example, Russia was supplying gas to Ukraine for a high price (a fair price + around $100) and offered discount of about $100, that just made the price fair. However, the discount was represented (especially, to Russian people) as a good will and a help for Ukrainians. The same way the regime often represents Putin’s failures as successes – for example, it is well known, that Putin agreed to meet in Minsk in the Normandy format (the so called Minsk II) after long pressure from the international community, but in Russia the Minsk II is represented as a generally Putin’s initiative. Certainly, the hypocrisy does its job and makes it complicated to see the true face of ruscism. Thus, only those countries, that had already become its victims – like Ukraine and Georgia – realized, that they dealt with a true fascist regime. Do the Europe and the rest of the world also need to suffer from the ruscism to understand the same?..